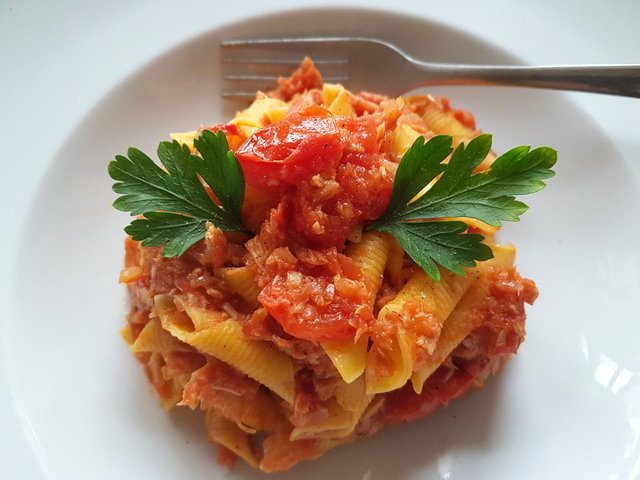 Garganelli Pasta with Tuna Bolognese : Recipe from Emilia-Romagna. This super simple but yummy 3 ingredient pasta with tuna recipe from Bologna is probably the easiest Italian pasta recipe I know. However, despite its simplicity, it was recently registered as a traditional recipe from Emilia-Romagna with the Italian academy of cuisine (L’Accademia Italiana della Cucina). Pasta con Tonno alla Bolognese. The Italian Academy of cuisine was founded in 1953 to preserve the gastronomical heritage of Italy! Before a recipe is registered with the Academy a lot of historical research is done to discover its origins and ties to the area where it is considered traditional. This research includes talking to restaurateurs and gastronomy experts. Food is a serious topic here in Italy! But, I guess rightly so as it’s such an important part of the country’s culture and traditions! 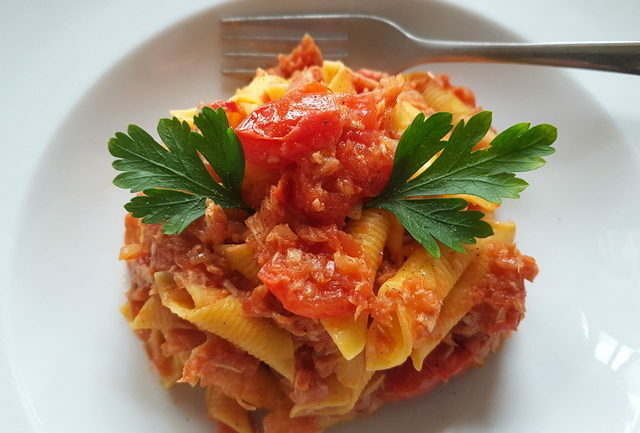 Pasta with tuna alla Bolognese is a classic fast pasta dish made with canned tuna, tomatoes and onion. Interestingly, although some Italians think of it as ‘fast food’ for lazy singles, it actually became a traditional Bolognese dish as a result of historical events and post war changes in the Italian diet. At this point I should mention that the traditional pasta for tuna alla Bolognese is spaghetti. In fact, in Bologna, this is spaghetti bolognese! The famous dish with meat sauce is known locally as pasta ‘al ragu’ and is made with tagliatelle not spaghetti! In this recipe, I used garganelli pasta, also a traditional food product from Bologna registered at the Italian Academy of Cuisine! You can read more about garganelli pasta if you click here. 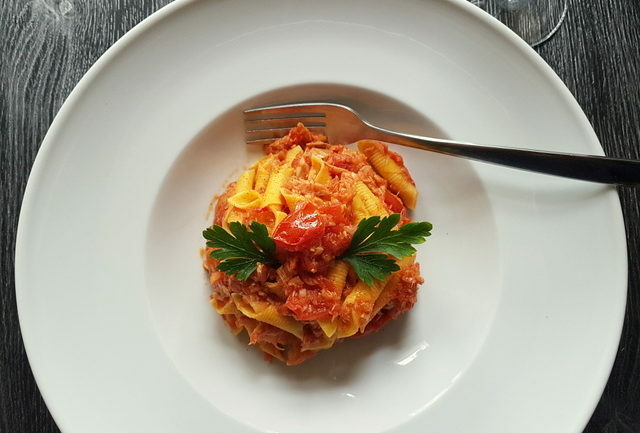 This short egg pasta is often eaten with meat ragu in Emilia-Romagna, so I thought it would go really well with tuna alla Bolognese! I bought fresh garganelli and it was delicious. But, of course, you can use spaghetti or other pasta of your choice! A little tuna Bolognese history! 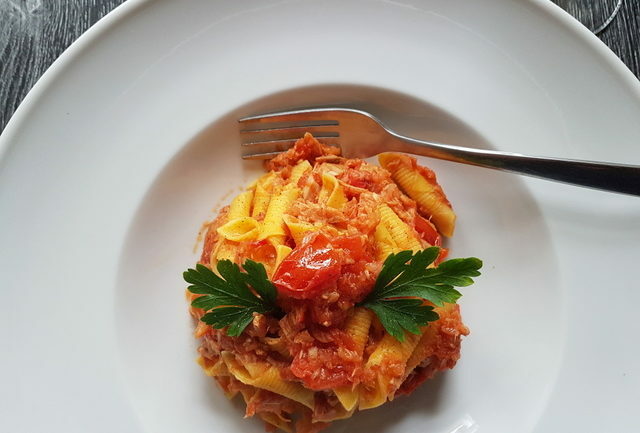 Apparently the first use of pasta with tuna in Emilia-Romagna dates back to the early post-war period. At that time, two fundamental things happened. Firstly, the spread and use of dried pasta, particularly spaghetti, in Northern Italy. Secondly, the marketing of tuna in oil as a result of the birth of a local canned tuna industry. 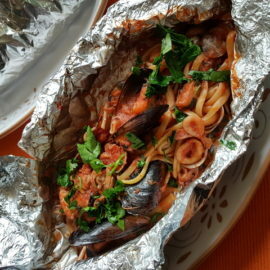 Both canned tuna and spaghetti were inexpensive, and combining them became an alternative recipe for what Italian call ‘lean days’ (giorni di magro). These are religious days of fasting, such as Good Friday or Christmas Eve, which call for abstinence from meat. In fact, for the less wealthy classes in Bologna, spaghetti with tuna Bolognese became a special dish reserved for Christmas Eve dinner. 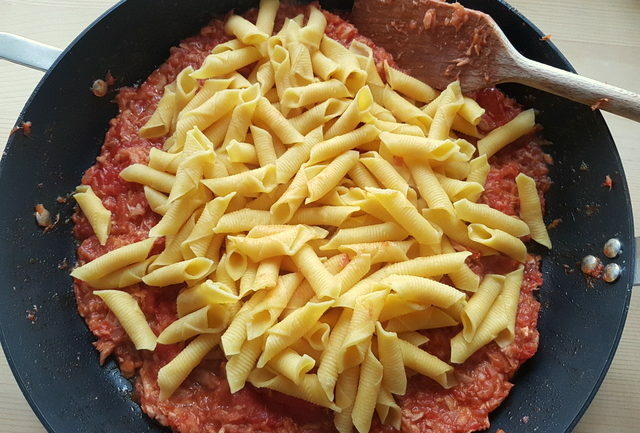 Other versions of pasta with tuna. 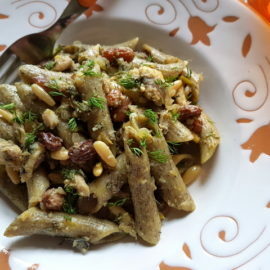 When I made this garganelli with tuna Bolognese, my Sicilian hubby wanted to add other ingredients such as olives and capers! 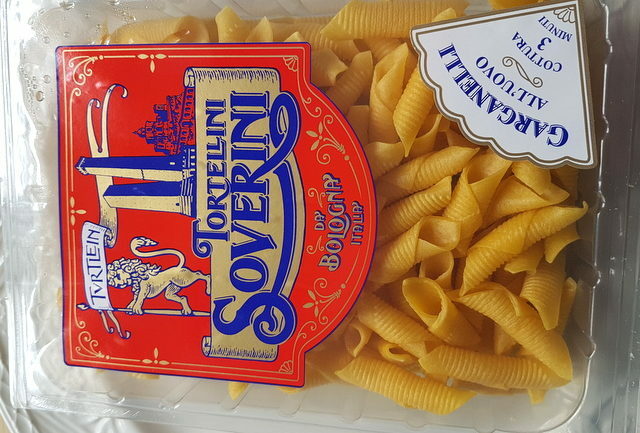 After all, pasta with tuna is made in other Italian regions too, especially in the South. But, this is the official version from Bologna! The ingredients are typical of Bolognese eating habits! So no garlic, olives or capers! The only exceptions allowed are the addition of anchovies or parsley sprinkled at the end of the preparation of the dish. I think, garganelli pasta with tuna Bolognese is a dish that’s so great for ‘lazy’ days when you don’t feel like spending time in the kitchen. It’s also very popular with kids. The 3 main ingredients are staples in most people’s larders. 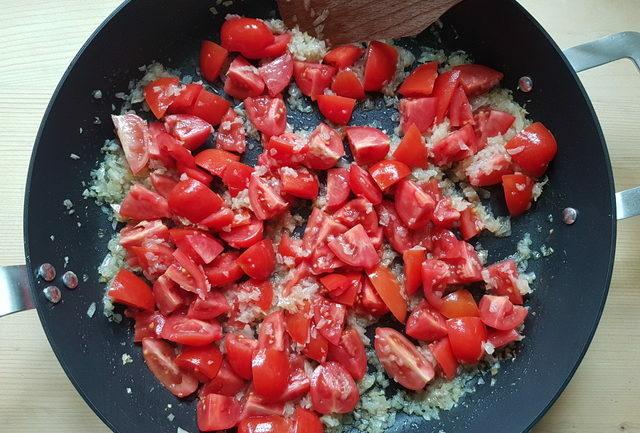 You can use fresh or tinned peeled tomatoes. 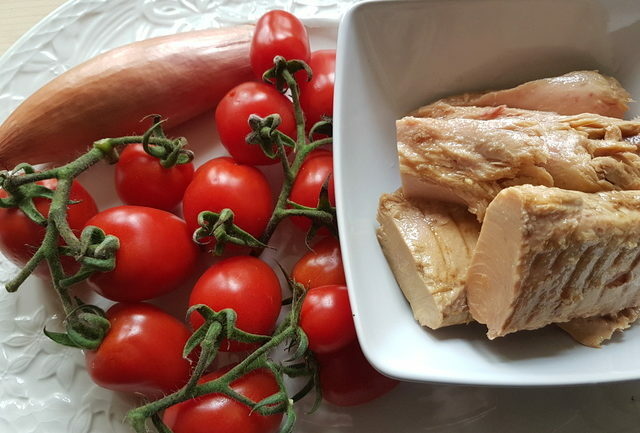 Italians use tuna that is preserved in olive oil. That’s definitely best. I like to use the slightly more expensive tuna fillets. Like all simple recipes the better the quality of the ingredients, the better it tastes! Don’t you agree? 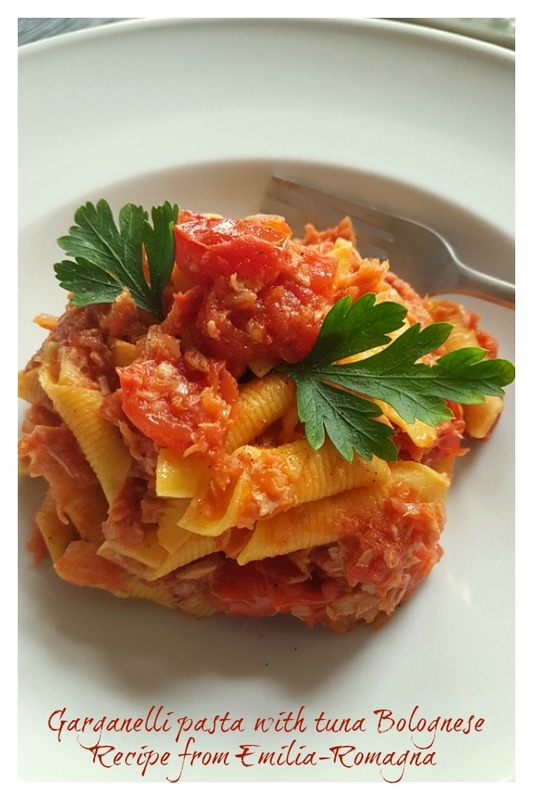 If you do try this garganelli pasta with tuna Bolognese recipe, I’d love to hear what you think. Please write a comment here on the blog or post a comment on the Pasta Project Facebook page. 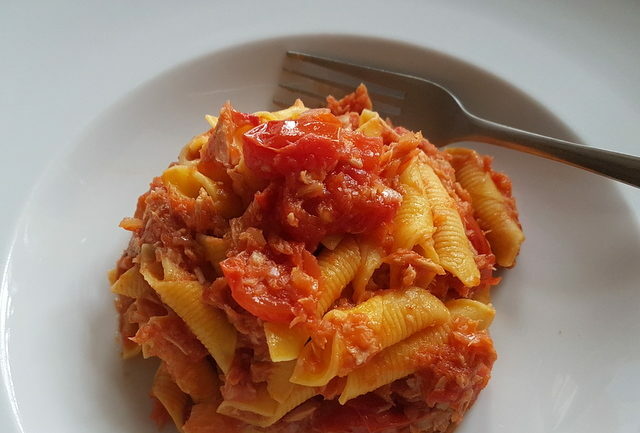 This simple but delicious 3 ingredient pasta with canned tuna and tomatoes is a traditional recipe from Bologna that is perfect for meatless days and when you don't feel like too many hours in the kitchen! Put a pot of water on to boil for the pasta, add salt once it starts to boil and bring to the boil again! Peel and cut the onion into very thin slices and peel the fresh tomatoes (if using) by blanching in boiling water for a couple of minutes. Then remove the skins and cut into quarters. Sauté the onion in the olive oil until it becomes transparent. Add the chopped/tinned tomatoes. Cook covered over a low heat for about 30 minutes, until the tomatoes are very soft. Stir occasionally to prevent the sauce from sticking and burning. Add salt and pepper to taste. 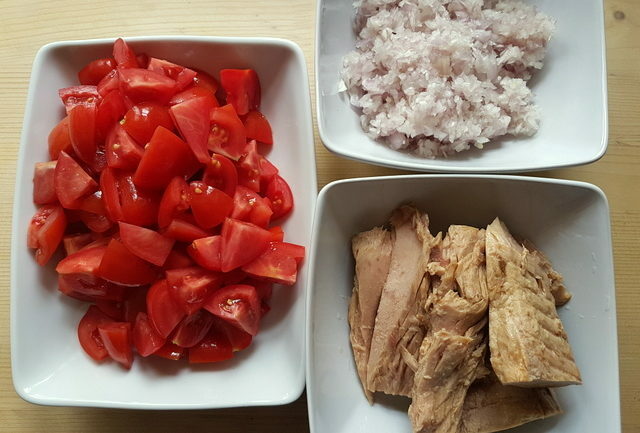 10 minutes before the sauce has finished cooking, add the drained tuna, broken into small pieces. . Meanwhile, cook the pasta al dente according to the instructions on the packet. 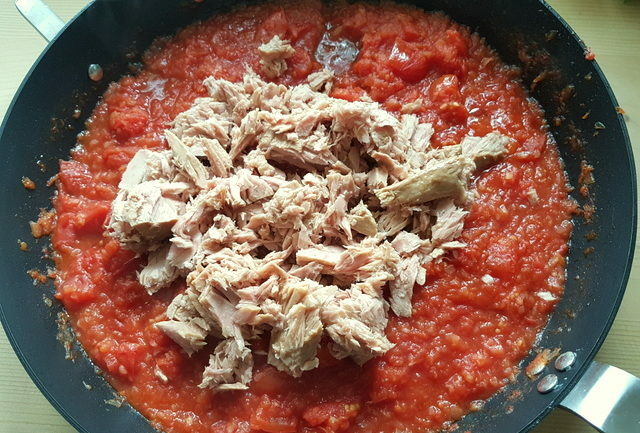 If the tuna and tomato sauce seems dry, add some of the pasta cooking water just before the pasta is ready. When the pasta is ready, drain it and mix with the sauce. Serve immediately with a sprinkling of chopped fresh parsley if required. This recipe is traditionally made with spaghetti. You can also use other pasta of your choice. If you like them add some anchovies when cooking the onions for extra umami flavour. I’ve never heard of this but it sounds amazing… I came across a chef once cooking a sardine bolognese which sounded and looked outstanding. I must try this! Being Italian, I really have to say ‘ una perfetta Pasta con tonno alla Bolognese’. Garganelli are the perfect pasta along with this sauce, an excellent recipe and I liked the history about it. Complimenti! 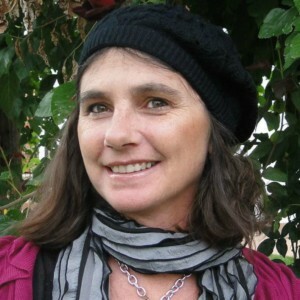 Your posts are always full of so much history – I read every last word! How interesting to know that ragu is traditionally made with tagliatelle in the region. and this tuna bolognese is definitely one I want to try! Tuna pasta is something so don’t make nearly enough and so absolutely need to! I love how easy this one looks. And I LOVE all the food history!! I have had pasta bolognese before, but never tuna bolognese! I love how easy this is and so delicious! Tuna Bolognese, I like the sound of that!! This definitely sounds like a lighter pasta dish than a heavy meat one and that is right up my alley. Thanks for sharing. Wow, tuna bolognese, never would have thought of this but it sounds delicious! I have never heard of tuna bolognese before, but it sounds great and something different for us to try for a change. This pasta looks amazing! I love anything with seafood! 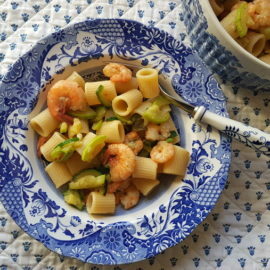 I love the simplicity of this dish, as well! So easy and tasty, I can’t wait to make it! OMG this tuna bolognese looks divine, and that pasta!!! I wish I could find all these types of pasta over here. I must look for these garganelli ones, they look so good, my kids would love them. Gorgeous. Recipe saved! Garganelli is a fabulous pasta Ramona. If you can’t buy it maybe you can make it yourself! 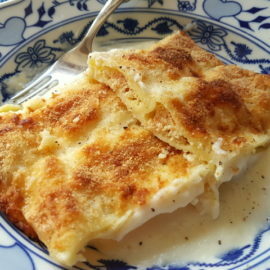 Happy you like this recipe! I’m sure your kids would love it!